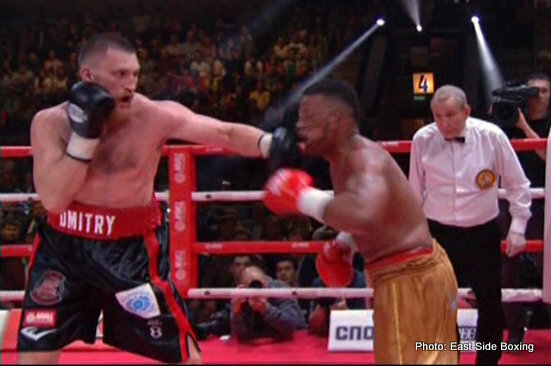 The Russian invasion of the cruiserweight division continued on Friday night at the Luzhniki arena in Moscow. All three Russian cruiser weights, Grigory Drozd, Rakhim Chakhkiev and Dmitri Kudryashov who fought on the under-card of Povetkin/Perez stopped their opponents and established Russian as the official language of the division. Oleksandr Usyk of the Ukraine must be mentioned as a potential game-changer in the division and he speaks fluent Russian as well. Marco Huck (Muamer Hukic) has studied Russian at school in his native Serbia as a boy but it will hardly help him come to terms with the advancing troops. Huck had an extremely hard time with Dennis Lebedev and the new guard seems tougher. Grigory Drozd was slated to defend his title against rugged Pole Krzysztof Wlodarczyk whose style is as awkward as the spelling of the name but Wlodarczyk backed off at short notice due to an illness. Last minute replacement Lucasz Janik from Poland filled in and fought as well as he could. Drozd was very well prepared and had little trouble adjusting to the new unknown challenger whose strength and brawn were more notable than his boxing IQ. Drozd warmed up into the game sticking and moving and wore down his man dropping him in the 7th en route to a 9th round TKO defending his WBC cruiserweight title. Rakhim Chakhkiev (23-1) faced Junior Anthony Wright (13-1) of the USA for the vacant IBO title. The previously unbeaten Wright boxed diligently and was able to sidestep and tie up the furious attacks of the southpaw strongman who grew increasingly agitated. Chakhkiev finally found a backhand body shot to the liver that put Wright away in the 8th. The left hook was so powerful it sounded like a gunshot when it landed. Dmitri Kudryashov (18-0, KO 18) fought Namibian Vikapita Meroro (28-5) who had not been KOed before. Kudryashov went 6 rounds with Meroro and demonstrated good technique/defense and generalship while he boxed the rounds away trying to solve the style of the opponent. The Russian was clearly looking for the big shot but he did not do it recklessly and deliberately, he worked for it and landed consistent set-up scoring shots that took their toll. Anytime he landed he took a step back avoiding counters and clinches. After he hurt the opponent he did not rush in for the finish, the end came logically after the KO artist put in as much effort as needed. Dmitri knocked down his opponent once with head shots in the beginning of the 6th and closed the show with a left hook to the liver that kept Meroro down long after the count. The Russian could have benefited from a couple of rounds more against a such a durable fighter. He is the future of the division and only Usyk has the skills and size albeit not the power to face the enigmatic weirdo Kudryashov. There seems to be a new breed of KO artists that has risen from the amateur ranks. Punchers who can box not too shabbily and comprehensively out-box their opponents before they finish them. Kovalev, Golovkin, Kudryashov, Beterbiev, Usyk are all master class boxers and their KO ratios are a bonus, a thrill factor that sometimes overshadows their boxing ability. The same thrill led some commentators and analysts to describe Roberto Duran as a brawler and a street fighter – I beg to differ with amusement, Duran was at least as technical as any pure boxer. Very often he was more technical because he did everything while he threw full power shots – he was a complete package with a versatile punch arsenal but he will be remembered for the brawling and the exchanges instead of the beautiful balance, leverage and coolness of execution.